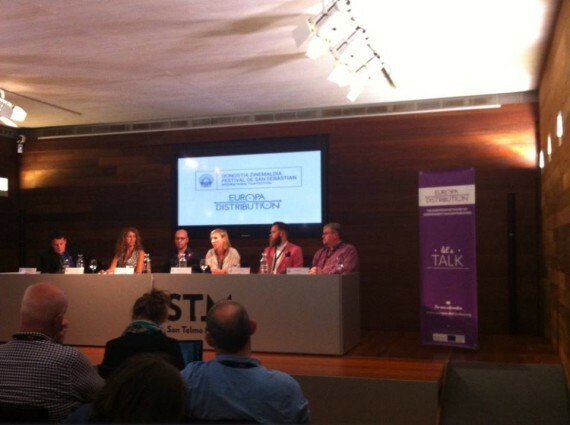 In the framework of the 63rd edition of the International Film Festival of San Sebastián (Spain), Europa Distribution in cooperation with the Industry Club organised a workshop on the theme « Pushing legal offer and fighting piracy ». “The basic pillars for films to exist online: new perspectives on discoverability, an eye-catching legal offer and a decreasing piracy” was the starting point of the workshop. Moderated by Michael Gubbins (SampoMedia, UK), this open panel gathered different point of views: from players from the sector of the new technologies as Chris Anderson from MUSO, an anti-piracy company (UK) and Kobi Shely from Distrify Media, online tools provider (UK), and from the industry such as Joachim Keil from Daredo, distributor in Germany, and Estela Artacho Garcia-Moreno from Fedicine, the national association of distributors in Spain, and responsible for www.mesientodecine.com, which gathers all Spanish legal offer. The voice of Media on the situation was heard through the participation of Lucia Recalde, head of Media Unit at the European Commission. Chris Anderson opened the panel with a provocative but inspiring statement, which has been running the two days of the workshop: “piracy should be seen as an opportunity”. Indeed, the high level of piracy shows there is a huge demand for some films: some pirates could be converted to legal consumers if the access to the legal offer is wider, easier and more efficient. For Lucia Recalde, if the fight against piracy is at the agenda of the Digital Single Market, the main point is to enlarge the access to European films and enhance the discoverability. As policy makers, Media needs to have discussion about what should do the program to build common strategies. All the speakers agreed on how education on legal offer and reinforcement are essential. All agreed also on the importance of knowing and targeting the audience and for that, having access to the data. Analysing and understanding the datas is key to increase the revenues, but, as it has been pointed during Europa Distribution annual conference in Karlovy Vary, accessibility to data’s is not easy. For Joachim Keil, Chris Anderson and Kobi Shely, in order to promote their film, the distributors have to use internet for building a fan base, which means building long term relationship with the audience. For Keil, it is imperative for a distributor to build a brand, define a strong editorial line, to be seen as a curator : it generates a trustful and prolific relationship with the audience. A big challenge in a digital world reshaping itself constantly. The second part of the workshop on “Fighting piracy and enhancing legal consumption of our films online” focused on feedbacks from independent distributors and representatives of European film agencies. Four distributors designed a big picture of the situation of piracy and legal offer in their countries and the actions they put in place. The situations are tremendously different in Germany and in Poland: this is another proof of the vital importance of a coordinated European and international action. In Germany, Daredo develops a positive approach and focus on who wants to pay, and its objective is to give a support to the consumer to find easily the legal content he is looking for. For Joachim Keil it is urgent to faster international legal actions. In UK, the focus is also on the promotion and visibility of legal offers. A platform was launched in 2009 with the support of Lottery money: www.findanyfilm.com. This platform, now under the control of the Industry Trust, allows the consumer to find where the film is screened and buy tickets, to buy the DVD or the Blu-ray or to find the platform where they can rent or buy the film. For Curzon, people who are pirating want to save money and time so the strategy of the company is to give a legal response. For Claire Roman, Curzon (UK), day and date release can be an answer in some cases. In The Netherlands, nothing has been done for reinforcement. On the other hand, there is a consensus to avoid punishing pirates as they are also the audience. For Louise Soplanit, Cinéart, education should be a priority. Katarzyna Orysiak, Gutek Film, Poland, draws a pessimistic picture of the situation: there is a combination of a lot of piracy, inexistent willingness to pay and very weak legal offer. Nothing is done against pirates since the government does not want to interfere. But, the people interested in arthouse content are not the main consumers of illegal platforms and as Gutek Film is perceived as a brand, the audience trusts its choices and its curated offer. 10 representatives from the EFADs (film agencies) then joined the distributors to have a common session on the topics of legal offer and piracy. Both associations feel that it is essential to develop the collaboration between industry, film agencies and supranational institutions and to work hand in hand. Christophe Tardieu, Director General at the French Cinema Center, CNC made a presentation of the strategy and the new tools they have set up in order to raise the visibility of legal offer and cut the revenues of the illegal websites. For enhancing the access to the legal offer they choose a consumer-centric approach. In few clicks a consumer can now know whether the movie he is looking for is available online and at what price thanks to a database storing information about all existing works and their availability online in France and partnerships with highly visited/ranked websites for cinemas goers. On the follow the money front, a Memorandum of Understanding was signed in March 2015 with advertisers and a steering group was set up with payment systems in September 2015. For the BFI, there is a constant gap between law and technology in the digital world. Pirates are good with new technologies and social media and they make the users’ habits change fast. The BFI’s strategy is to focus on both enhanced legal access for audiences and on robust protection for right holders. A new initiative, Creative Content UK, led by the private sector but part-financed by public money, will focus on helping to educate people about where they can legally access work from different creative industries, including film, music and publishing: https://www.getitrightfromagenuinesite.org/. In particular, it aims to effect a change in the understanding and behaviour of all citizens and consumers in relation to creative and cultural content, with a particular focus on 16-24 year olds. The workshop closed on a presentation of simple, accessible tools that a distributor can use to get the control back on his contents, protect his films and reach even more their audiences. The MUSO’s strategy is to help the distributor enhancing the access to its films through the hunt of illegal accesses. The illegal links or files are erased and a message invites the user to the legal access to the film. Distrify Media gives the possibility to the distributor of managing the diffusion of their film and its marketing through the utilisation of a VOD player. By developing their own platforms, distributors may have access means having the access to the datas will help to target the best audience through an even more tailor-made marketing strategy. After two days of exchanges, it is clear that big changes have operated in the way piracy is considered and fought and in how legal offer is supported and defended by distributors, institutions and organisations. We are far from the politic of sanction of the early age of digital. Players are now searching for innovative ways of enhancing the legal offer and the discoverability of films. Everything converges toward simplicity: simplicity of the accessibility to legal offer, of the use of technical tools to erase illegal links, while taking a consumer approach. The necessity to access data of the exploitation of the contents, and elaboration of soft laws as to be pointed as well. Nevertheless, it is crucial that institutions keep working on bigger scale, work on international coordinated actions and insure the access to the datas. A positive approach should give positive results.